Read about our new build services in Yorkshire, including barn conversions and large extensions in Yorkshire, call us today on 07973 757641 of a quote. 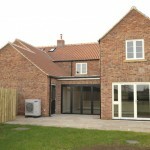 For over 20 years our expert builders have been responsible for a variety of new build construction including barn conversions, large extensions and private land development for a diverse range of clients throughout North Yorkshire and West Yorkshire. New build developments represent 60% of our working year. With every project we take the time to discuss the look and feel you are trying to achieve and then ensure we source the best quality materials to deliver the desired finish. Our continued growth in this area is mainly through recommendation; our builders work with pride and care and have a genuine interest in their work. From the outset of any project we like to offer ideas and suggestions that may help enhance or personalise a project but also understand how difficult it can be to visualise a new space or finish and this is where our experience becomes invaluable – we are not just ‘builders’, but a team of experienced individuals with a wealth of knowledge and ideas, ensuring that your new build will not only exceed your expectations, but will provoke continued thought and conversation with your family and friends. To see images of our new build work, go to our Code 4 Sustainable Housing New Build case study here.